Fabuloso All-Purpose Cleaner makes everyday cleaning tasks quick and easy. 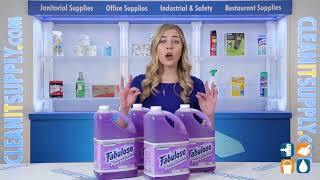 Fabuloso works hard to clean your home, leaving behind no residue, just a pleasant lavender fragrance. The super degreasing formula works to leave a multitude of household surfaces sparkling clean and smelling fresh. This convenient spray bottle allows you to clean without having to add water or use or cart around a heavy bucket. Just spray and wipe with a sponge, lint-free cloth or paper towel. It’s that easy! This lavender-scented Fabuloso All-Purpose cleaner is effective for a wide variety of cleaning applications and is ideal for cleaning walls, kitchens, food service areas, appliances and much more.